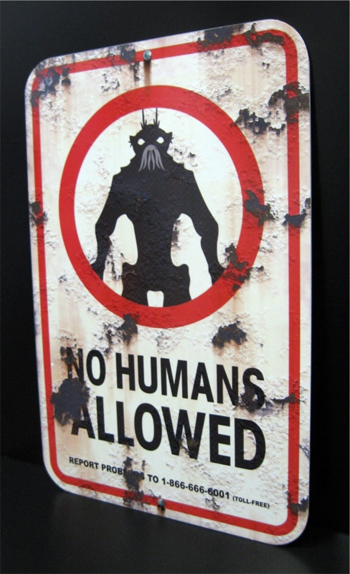 Why is District 9 so effective? The background of District Six, Cap Town South Africa and the forced removal of its 60.000 inhabitants in the 1970'ies gives the movie an eerie reality; something that fits what Charles Peirce called "a ground for understanding signs". When Neill Blomkamp and Terri Tatchell wrote the script and screenplay they adhered to the wisdom of H.G. Wells about SciFi "If anything is possible nothing is interesting". The vulnerability and limitations of the aliens possessing such superior technology and the weakness of the hero Wikus van de Merve (Sharlto Copley) makes everything in the movie unpredictable and interesting. We feel with the characters. We smell the rotten things, feel the dusty wind, feel their pain and anguish and anger. We care about them, even the villains. We feel that this is plausible. Since news and documentaries are the way we learn about distant places this is how most of us not living there would get information about an alien ship hovering over Johannesburg and about the problems in Soweto. The portable video camera emphasizes familiarity, reliability, telling the unedited truth. 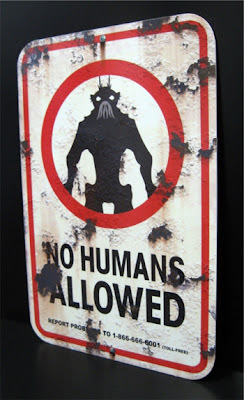 District 9 is not the usual SciFi roller coaster with wows and huhs and eyees and then total emptiness after the ride. Instead, after watching the movie with many wows we feel that someone has opened a new perspective into how to look at things in apartheid South Africa past, in Africa present, in the human world around us, in us and those we love. Last but not least, District 9 is so effective because of Sharlto Copley who is living through the story and not acting at all. 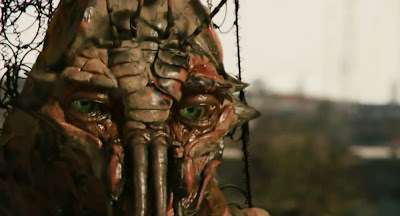 The sad thing is that the depiction of us humans in District 9 is so sad and truthful. Our hearts go with the persecuted, the violated, those from whom we deny human rights and consider them aliens that can be treated anyway we wish. Christopher and his son. The most sympathetic characters in District 9. Everything you said about why the movie works is so true. A lot of people don’t know that Neill Blomkamp grew up in South Africa, but moved to Canada when he was about 18. He’s seen the differences between Third World and First World countries and the way people are treated in both places. That’s where he pulled the story from. People say the whole “aliens land on earth, humans are bad, aliens are good” premise is unoriginal, which is true. But when you think about what led Blomkamp to write the movie, you will realize he’s not writing about aliens and humans. He’s writing about real struggle in doing what’s right, especially when your own life is on the line. I’m looking forward to his next movie, Elysium. Knowing Blomkamp, it’s going to be amazing. This movie hurts because it is so true in the way you describe. Elysium... The name at least is happy! It unfortunately won't be. I read the leaked script, coz I've been waiting for a Neill Blomkamp/Sharlto Copley movie since I saw D9. It's insanely good, but almost as painful. I was in tears after I was done. Can't wait for it to finally come out in August, tbh.